Habit: Perennial herb, glabrous, often robust. Stem: wings often >= 2 mm wide. Leaf: stipules small or large; leaflets 2, 5--14 cm, lanceolate to ovate; tendril branched, coiled. Inflorescence: 4--15-flowered. Flower: calyx tube > lobes; corolla 20--25 mm, pink, pink-purple, or red. Fruit: glabrous. Chromosomes: 2n=14. Ecology: Disturbed areas, especially roadsides; Elevation: generally < 2000 m. Bioregional Distribution: CA-FP; Distribution Outside California: sporadic to eastern United States; native to Europe. Flowering Time: Apr--May Note: Cult as ornamental. Locally conspicuous. 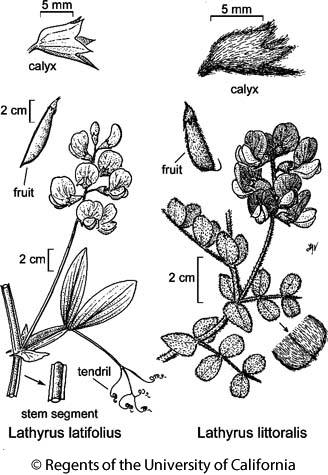 Citation for this treatment: Kelly Steele & Duane Isely 2012, Lathyrus latifolius, in Jepson Flora Project (eds.) Jepson eFlora, http://ucjeps.berkeley.edu/eflora/eflora_display.php?tid=30318, accessed on April 19, 2019.